The AAAC of the SD REP ask that you support us as we empower Urban communities through 26 years of Cultural Enrichment, using the Arts to promote Healthy, Active, Fit youth and communities. 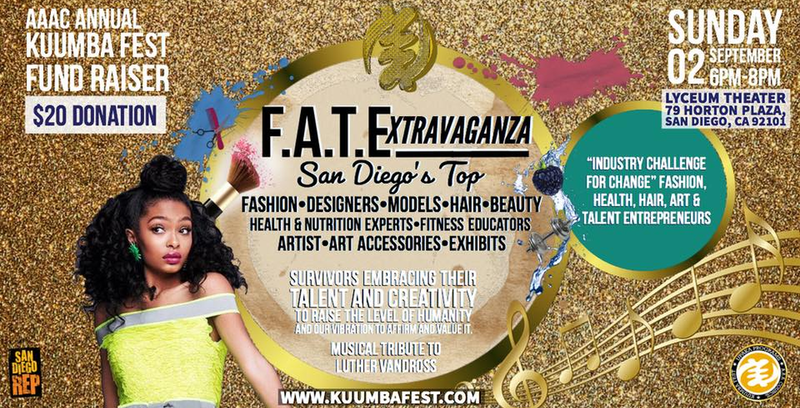 F.A.T Extravaganza is an integration of professional community members ranging from therapist and designers to visual artist or just talented performers that come together with local positive aspiring entertainment or creative entrepreneurs to CREATIVELY give back and raise the creative level of awareness and resistance to self defeating behavior. The work this team does as members of the AAAC of the SD REP is Project FATE teaching youth and community participants how to be Masters of their own FATE through edutainment, creativity and the performing healing arts. This is the 7th year experience.